2012 was a huge year for Sydney’s Chance Waters; he released his acclaimed sophomore album Infinity which debuted at #54 on the ARIA Charts, was nominated for Unearthed Artist of the Year at the 2012 J Awards and his video for second single Maybe Tomorrow (ft. Lilian Blue) was voted #7 in the 2012 rage fifty ahead of M.I.A., Alt-J, Grimes, Tame Impala and The Temper Trap among others. Chance Waters then proceeded to secure not one but two entries in triple j’s Hottest 100 with Maybe Tomorrow (#89) and Young & Dumb ft. Bertie Blackman (#45). 2013 is promising to be an even bigger year for Chance Waters as he announces he is hitting the road and embarking upon a huge 19 date tour. 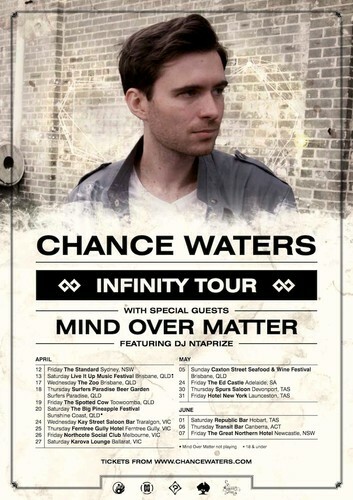 Armed with tracks from his acclaimed album Infinity, Chance Waters will be zigzagging across the country throughout April, May and June and bringing his infectiously upbeat and thought-provoking tracks to Sydney, Brisbane, Surfers Paradise, Toowoomba, Sunshine Coast, Traralgon, Ferntree Gully, Melbourne, Ballarat, Adelaide, Devonport, Launceston, Hobart, Canberra and Newcastle as well as appearances at Live It Up, Caxton Street and Big Pineapple music festivals. Chance Waters’ second album Infinity is a challengingly existential collection of songs; equally in his element questioning the fabric of reality (‘Infinity’), joking about the end of days (‘Maybe Tomorrow’) and confronting personal demons (‘Feel Alright’), Infinity is a record which demonstrates the depth of detail and passion that sets Chance Waters' writing apart. Don’t miss Chance Waters bringing Infinity live to a city near you!